California Dreaming menu prices are here. The California Dreaming restaurant extensive menu includes dishes that are prepared from scratch daily and include American classics and unique favorites. Guests to any of the locations will experience a unique dining location with a welcoming atmosphere. Below are the latest California Dreaming menu prices. California Dreaming offers full-service catering for small and large events. Full-service catering includes wait staff, delivery, and setup plus great tasting food. Guests can choose from the regular menu or specially designed menu. For guests that want to get regular updates on new dishes, events, or exclusive offers, they can sign up to be on the California Dreaming mailing list. Alternatively, guests can regularly visit the California Dreaming website to stay updated. 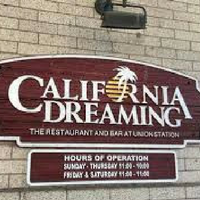 California Dreaming opened its first location in a historic railroad station in 1984 in Columbia, South Carolina. Today, guests can choose from (9) one-of-a-kind locations such as a castle or a waterfront fort. The California Dreaming brand is owned by CentraArchy Restaurants based in Charleston, South Carolina. For more information about California Dreaming, visit their official website. Does California Dreaming have a take-out menu? All items on the California Dreaming menu can be ordered for take-out (curbside to-go). Does California Dreaming take reservations? Reservations are not mandatory but appreciated. Walk-ins are always welcome. What are the hours of operation for California Dreaming?